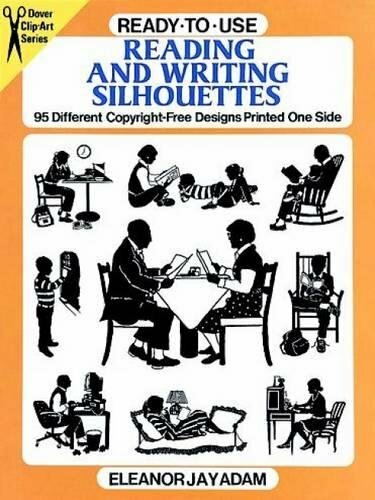 Add eye-catching appeal to a variety of graphic projects easily and inexpensively with this practical and delightfully rendered collection of silhouette designs. Illustrator Eleanor Jay Adam has created 95 charming, royalty-free illustrations related to reading and writing. Here are youngsters posing as bookends and reading as they lean against a stack of giant books, a couple examining menus in a restaurant, a girl enjoying a book at the beach, a woman working at a computer, a young girl reading in a cozy window seat, and dozens of other engaging vignettes. Effective devices for drawing attention to almost any printed announcement, these immediately usable illustrations, each printed in two handy sizes, are ideal for newsletters, advertisements, posters, and other message bearers.